Top Spice, Vinings GA – Marie, Let's Eat! Did you miss us? I enjoyed having a few days not having to worry about what I was going to write. This has allowed me the chance to stretch out a little and get ahead of my personal deadlines between here, my book review blog and my LiveJournal. At any rate, we continued to eat well over the last several days. A few weeks ago, Samantha suggested that we meet up for supper at Lemon Grass in Marietta, and proceeded to order some really excellent food. I remembered this when NoGeo was invaded by several out-of-town friends whom we don’t see nearly often enough for Anime Weekend Atlanta. Now in its sixteenth year, AWA was founded by my best pal, Dave, who has lived in Toronto for the last six years. On the Friday night of the con, Marie and I went to supper with him and with our great friend Brooke, whom you may recall lives in Nashville, and who is the executive director of that city’s upstart GMX convention. A little shop talk was shared. Cons being the schedule-crazy things that they are, it’s difficult to get away somewhere very close by for a good meal, particularly in the Cumberland Mall area. Not only is there pretty slim pickings in the immediate vicinity of the convention center, getting to a better restaurant – and one with no wait and prompt service – might mean navigating awful traffic and dozens of red lights. If you’re in the convention center at the Galleria, Big Chow Grill – formerly The Real Chow Baby – is a decent idea, but the place does get amazingly loud and crazy on Friday nights. No, for some place you can enjoy a good meal and not have to scream across the table, your best option is probably Top Spice, about a mile south on US 41. I was not at all biased by a desire to try some more nam sod and coconut soup like Samantha had the week before. Really. Top Spice has three locations in Atlanta. This one is the furthest out of the city center, still inside the perimeter in the outskirts of the Vinings community, and oddly placed between a Toys R Us and a post office just behind the Akers Mill shopping center. Their web site is absolutely no help whatsoever in learning about the restaurant’s history. At a guess, they opened within the last decade. The interior is very lush, with deep red walls and quite nice furniture. The food is quite good, although I’m afraid that Lemon Grass might have spoiled me for nam sod. Top Spice’s is still very tasty; while not at all spicy, it is moist and full of ginger. 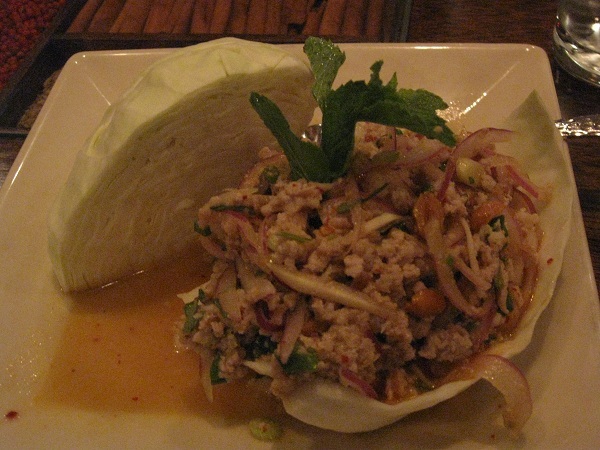 Lemon Grass’s version has a little more kick, is a little less juicy, and I preferred the cabbage that it came with. Definitely a case of a good meal suffering only by comparison. 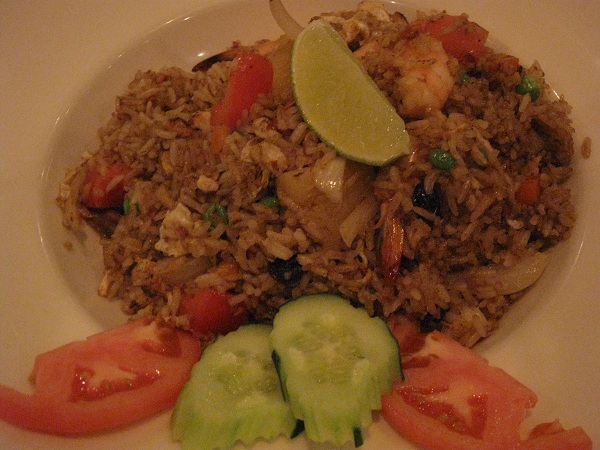 Marie had the shrimp pineapple fried rice and really liked it. She shared one of her shrimp and I thought it was perfectly fine. Really, for the price, they provide a simply excellent meal, and, again, it’s better than any other option by the mall without driving a lot farther, particularly if you want a quiet place to catch up with old friends. Posted on September 26, 2010 July 29, 2017 by Grant G.Posted in atlanta, georgia, thaiTagged atlanta, georgia, thai, vinings.